The crucial importance of the struggle for a communist party to oppose the lies of the agents of the bourgeoisie and to put forward a clear and coherent revolutionary alternative. Such a party can only be centralised on a world scale since the revolution itself can only succeed on the world-wide arena. As the CWO put it in their article “The significance of the German revolution: Reflections on the CWO/ICT public meeting in London , November 17 2018”, “without a revolutionary working class nucleus around which a party can be built there is not the slightest possibility of a successful outcome of our struggle”. “Given the above scenario it was therefore surprising that a member of the Internationalist Communist Current (the only other organisation present in the meeting), and whose other comrades made positive contributions to the discussion, should pose the question that August 1914 was too early for the Internationale group to split from German Social Democracy. He surprisingly argued that August 1914 was not a definitive betrayal of the international workers’ movement. He went to say that as the ICC and ICT both came from the tradition of the Italian Communist Left that we should recognise that this was just like the members of the Communist Party of Italy (PCd’I) who went into exile in the 1920s. They had seen the party they founded taken over by the ‘centrists’ like Gramsci and Togliatti, with the support of the Communist International (even though the Left still had the support of the majority of the PCd’I). However as they had no clear evidence that this meant that the Third International had finally and irrevocably broken with the international revolution (and given the abrupt changes of policy of the Comintern this was a period of great confusion) they decided that they would form themselves into a ‘fraction’. The aim of the Fraction was either to persuade the Comintern to stick to revolutionary internationalism or, if that failed and the International did something which definitely showed that it had betrayed the working class, then the fraction should form the nucleus of a new party. In actual fact the Fraction did decide in 1935 that the Comintern had gone over to the other side of the class barricades (with the adoption of the Popular Front). However it was then divided between the followers of Vercesi, who now argued that the party could only be formed in conditions when it could win a mass following (similar to Luxemburg), and those who wanted to begin to build it in the 1930s. The issue was never resolved and the Fraction collapsed in 1939. We replied that the two cases of Germany in 1914 and the Italian comrades in the 1920s were not the same. As the foregoing analysis shows, the SPD’s vote for war credits was a clear and obvious betrayal of the working class cause. And this judgment is not the product of hindsight. There were other socialists at the time (like Lenin, but not just him) who loudly said so. The need was for a new banner around which the revolutionary working class could rally. The sooner that banner was raised the quicker the revolutionaries could get to work to build for the movement which would break out, sooner or later, against the war. And the fact that Germany was a federal state saturated in localism made this task all the more urgent”. We have quoted the CWO at length because we want to make sure our response deals accurately with their views. But in doing so, we will have to take up some important inaccuracies in the CWO’s account, regarding both certain historical elements and our own understanding of them. To begin with, it is misleading to say that, for the ICC, “August 1914 was not a definitive betrayal of the international workers’ movement”. On the contrary: the capitulation of the majority social democrats, inside and outside parliament, was indeed a definite betrayal of everything that international social democracy had stood for and had voted on at major international congresses. It confirmed that the opportunist right wing of social democracy, against which militants like Luxemburg had been waging a determined struggle since before the end of the 19th century, had crossed the line into the enemy camp – a step from which there could be no turning back. Our point however was that the betrayal of a substantial part of the organisation did not yet signify that the entire party had been integrated into the capitalist state; that precisely because - contrary to what some anarchists claim – social democracy had not been bourgeois from the beginning, the treason of August 1914 gave rise to a huge battle within the party, to a flood of reactions against the betrayal, many of them confused and inadequate, bounded by centrist and pacifist conceptions, but still expressing at root a proletarian internationalist reaction against war. The clearest, most determined and most famous amongst them were the Spartacists. And as long as this battle continued, as long as the various oppositions to the new official line could still operate within the party, the question of the fraction, of an organised, internal fight for the “soul” of the party - until either the purging of the traitors or the expulsion of the internationalists - was still entirely relevant. “what is not true even for the life of individual human beings is a total absurdity at the level of an historic movement such as that of the proletariat. Here the passage from life to death is not measured in seconds or even minutes but in years. The moment when a workers’ party signs its own death certificate and its actual, definitive death, are not the same thing. This is perhaps difficult to understand for a radical phraseologist, but it is quite understandable for a marxist who doesn’t have the habit of deserting a ship like a rat when it begins to take in water. Revolutionaries know the historical meaning of an organisation which the class has given birth to, and as long as it still contains a breath of life they fight in order to save it, to hold onto it for the class”. Neither is it true that the situation of the German revolutionaries in 1914 was fundamentally different from the comrades of the Italian left who decided to form a fraction to fight against the degeneration of the Communist Party of Italy in the 1920s. On the contrary: in both cases, you have a party that is being increasingly dominated by an openly bourgeois faction (social chauvinists in the SPD, Stalinists in the CP), and an opposition divided into a vacillating centre and a revolutionary left, which has rightly decided that, even if the tide is turning against the class, it remains an elementary duty to fight as long as possible for the real programme and traditions of the party as long as there is any proletarian life left in it. In contrast, the method of the CWO in describing the situation of the SPD in 1914 bears a curious resemblance to the old (essentially councilist) CWO position about the Bolsheviks and the Communist parties – that they were already totally bourgeois in 1921 and anyone who thought otherwise was basically an apologist for their subsequent crimes. We could also take up the extremely simplistic presentation of the history of the debates within the Italian fraction up to 1939, but it would be better to come back to that in a separate article, since the CWO has recently republished an article by Battalgia Comunista on the question of fraction and party, with a long introduction by the CWO which voices many of their criticism of the ICC, not only on the question of the fraction and the party but also on our analysis of the world situation. But one of the key points that emerge from both the BC article and the new introduction is the idea that a fraction is basically just a discussion circle which has little interest in intervening in the class struggle: as they put it at the end of the article on the public meeting, “This is not a time for fractions or discussion circles. It is time to form nuclei of revolutionaries everywhere and for them to converge in the creation of an international and internationalist revolutionary party in preparation for the inevitable class conflicts of the future”. If – despite their many weaknesses – the Spartacist group was fundamentally playing the role of a fraction within the SPD, whose long dynamic of degeneration accelerated dramatically towards a final point of rupture after the watershed of August 1914, then fraction work is clearly something very different from a retreat into academic debate removed from the daily reality of war and class struggle. On the contrary, there is no question that the Spartacists did “raise the banner” of the class struggle against the war. Within the SPD the Spartakusbund had its own organisational structure, published its own newspaper, put out many leaflets and was able, along with some of the most radical elements in the class (in particular the “Revolutionary Shop Stewards” or “Obleute” in the industrial centres) to call for demonstrations which regrouped thousands of workers. This distinct organisational structure was retained as a precondition for the Spartacists entering the USPD almost 3 years after the beginning of the war in April 1917, following the mass expulsion of the opposition from the SPD. This decision was taken, as Liebknecht put it, “in order to drive it forward, to have a platform for our position, to be able to reach thousands of elements.” As Marc comments in his text: “It is more than doubtful if this strategy was valid at this moment, but one thing is clear: if such a question was posed for Luxemburg and Liebknecht, then it was because they rightly considered the USPD to be a centrist movement and not a party of the bourgeoisie”. In sum, the fraction work of the Spartacists continued whether inside or outside a larger party, as an independent force seeking to create the conditions for a new party purged of both bourgeois and centrist elements – just as it continued for the Italian left in the late 20s and 30s after their expulsion from the party and even after their recognition that the CPs had passed over to the enemy. Thus a part of the CWO’s criticism of the Spartacists for staying too long in the old party is founded on this misconception of the role of a fraction as a discussion circle whose activity is in some sense opposed to the formation of revolutionary nuclei who prepare the ground for the future world party. On the contrary: that was precisely the concept of the fraction as elaborated by the Italian left. The difference lies elsewhere: in the recognition (shared by both Luxemburg and the Italian left) that the constitution of a new international party was not the product of the will of revolutionaries alone, but was dependent on a much wider and deeper process of maturation in the class. “In Russia the Bolsheviks were estimated at only 8000 – 10,000 in number at the start of 1917 but they were present in almost every town or city and, more importantly, embedded in the wider working class. Thus when the revolutionary movement arose they were not only able to give a lead but grew inside it. Workers had called spontaneously in February 1917 for ‘soviet power’ (based on the memory of 1905) but by the summer of 1917 it was clear that only one party supported ‘all power to the soviets’ and this party in most estimates now had 300,000 members”. It is certainly true that the Bolsheviks were in the vanguard of the revolutionary movement in the years 1914-19. On the question of war, the Bolshevik delegation to Zimmerwald defended a much more rigorous position than that of the Spartacists: they, along with the German “left radicals”, raised the slogan “turn the imperialist war into a civil war”, whereas the Spartacist delegation showed a tendency to make concessions to pacifism. In their actual practise in a revolutionary situation, the Bolsheviks were able to analyse the balance of class forces with great lucidity and thus play a key role at decisive moments: in July, when it was necessary to avoid the provocations of the bourgeoisie who were trying to draw revolutionary workers into a premature military confrontation; in October, when Lenin insisted that the conditions for the insurrection had definitely ripened and it had become vital to strike before the moment passed. This was in tragic contrast to the young German Communist Party which made the monumental error of taking the bourgeoisie’s bait in January 1919 in Berlin, in no small measure because the Spartacist leader Liebknecht broke party discipline in pushing for an immediate armed uprising. However, the capacity of the Bolsheviks to play this role cannot be reduced to the notion of being “embedded” in the class. It was above all the product of a long struggle for political and organisational clarity within the Russian Social Democratic Labour Party, which made it possible for the Bolsheviks to grasp what was really at stake after the February uprising, even if it required a determined struggle inside the party to chase out a very strong tendency towards support for bourgeois democracy and a “defencist” position in the war – this was the whole meaning of the debates around Lenin’s April Theses. The fact that the Bolsheviks came out of this debate strengthened and more determined to fight for soviet power was the product of two essential factors: on the one hand, their organisational solidity, which made it possible to maintain the unity of the party despite the very sharp divergences that appeared within it during the revolutionary process; and on the other hand, the fact that, from the beginning, their political programme – even when it was not yet as clear as it became after 1917 – was always based on the principle of class independence from the bourgeoisie, in contrast to the other main tendency in Russian social democracy, the Mensheviks. But what all this really points to is that in the years between the birth of Bolshevism and the outbreak of the revolution, the Bolsheviks had themselves carried out the central tasks of a revolutionary fraction inside the Russian party and the Second International. The Bolsheviks’ rigour on organisational and programmatic issues was one side of this capacity to make the transition from fraction to party; the other side was the rapid maturation within the Russian proletariat as a whole. This was a proletariat which was far less vulnerable to reformist illusions than its class brothers and sisters in Germany: both at the level of their living conditions, and of the political conditions imposed by the Tsarist regime, their struggle necessarily took on an explosive and revolutionary character which, in a sense, already indicated the circumstances that would face the working class in the most advanced countries in the new epoch of decadence. This was a proletariat which, largely denied the possibility of building mass defensive organisations inside the old system, gave rise in 1905 to the soviet form of organisation and gained an inestimably valuable foretaste of what it means to make a revolution. It must also be remembered that the Russian proletariat faced a much weaker bourgeoisie, whereas the German workers would be catapulted into revolutionary struggles against a powerful ruling class which knew it could count on the support of the SPD and the trade unions as well as that of the international bourgeoisie. From this point of view, we can better understand why the question is not reducible to a kind of physical presence of revolutionaries within the working class, however important that is. 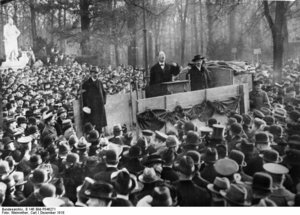 The German social democrats certainly had a huge presence within the working class, in all areas of its life – economic, political, cultural. The problem was that this influence within the class was increasingly geared towards institutionalising and thus neutralising the class struggle. The key difference between the SPD and the Bolsheviks was in the latter’s capacity to maintain and develop the class autonomy of the proletariat. Finally, to really understand the contrast between the Bolsheviks and the Spartacists, to go deeper into the immense problems confronting the communist minority during the revolutionary wave after 1917, we must integrate the particular situations pertaining to this or that country into a wider international vision. The Second International did indeed fall apart in 1914: faced with the betrayal of substantial parts of its national components, it simply ceased to exist. This posed immediately the necessity for a new International, even if the conditions for its formation had not yet come together. The late formation of the Communist International - and its accompanying programmatic weaknesses - was to be a major handicap not only for the German revolution, but for the Russian soviet power and the whole revolutionary wave. We will come back to this in other articles. We have argued that the prior work of the left fractions is an indispensible basis for the formation of the party on a solid basis. But we also have to recognise that, in the early part of the 20th century, when the danger of opportunism within the social democratic parties was becoming increasingly evident, the left fractions who opposed this drift towards integration into the politics of the bourgeoisie were shackled by the federal structure of the Second International. This was an International which largely functioned as a kind of co-ordinating centre for a collection of national parties. There was solidarity and cooperation between the different left currents (for example, when Lenin and Luxemburg worked together to draft the Basel resolution on war in at the International Congress of 1912), but there was never an internationally centralised fraction which could develop a coherent policy in all countries, a unified response to all the dramatic changes that were being wrought by capitalism’s passage to an epoch of wars and revolutions. Today’s revolutionary groups are not literally fractions in the sense of being an organic part of a former workers’ party, but they will not be able to prepare the ground for the party of tomorrow if they fail to understand what we can learn from the historical contribution of the left fractions. The CWO is the British affiliate of the International Communist Tendency; a comrade from their German group, the GIS, also took part in the meeting. While it was positive that both organisations recognise the historic importance of the revolution in Germany – which effectively put an end to the First World War and for a brief moment threatened to extend the political power of the working class from Russia to western Europe – it was a mark of the disunity of the existing revolutionary movement that two meetings on the same theme were held in the same city within a week of each other. The ICC had proposed the holding of a joint meeting to avoid this partial clash, but the CWO rejected our proposal for reasons which are not clear to us. This was in contrast to the meetings on the Russian revolution held in 2017, where the CWO agreed to give a presentation at our day of discussion in London https://en.internationalism.org/icconline/201712/14536/icc-day-discussion-russian-revolution For us, the fact that the groups of the communist left are more or less alone in preserving and elaborating the essential lessons of the revolution in Germany is sufficient reason for them to coordinate their response to the ideological distortions of this event put out by all factions of the ruling class (which also include its virtual erasure from the records of history). This disagreement was the main focus of the discussion at the CWO meeting. The discussion was again central at the ICC meeting, although there was also a debate around the questions posed by an internationalist anarchist comrade about whether there is a need for a party, and whether centralisation corresponds to the organisational needs of the working class. On this question of the need for centralisation as an expression of the tendency towards unity, the comrade later said that he found our arguments clear and convincing.